On Tuesday night, National Soccer Hall of Famer Gene Olaff, the “leading American goalkeeper of the 1940s,” passed away at the age of 96. Our thoughts are with his family and friends. His funeral service will be on Monday, Jan. 21 at 11 am at the Dennison Funeral Home in Florence, NJ, followed by his burial at Odd Fellows Cemetery in Burlington, NJ. On September 23, 2013, National Soccer Hall of Fame historian Roger Allaway honored Olaff in his first article for PSP. We reproduce his article below. Gene Olaff, a former goalkeeper who lives in Florence, N.J., will celebrate his 93rd birthday today. Olaff is not a Philadelphia soccer hero of decades past. His entire semipro and professional soccer career, from the late 1930s to the early 1950s, was spent with New York teams. Although he did play numerous games in Philadelphia over the years, it was always as a member of the visiting team. However, he has lived in the Philadelphia area, in Florence, for more than 60 years. These days, he probably has more ties to Philadelphia than to New York. Gene Olaff made his name in soccer particularly with the Brooklyn Hispano team in the 1940s. By the time Hispano won the double in 1943, taking the American Soccer League championship and the U.S. Open Cup, he was in the Navy. 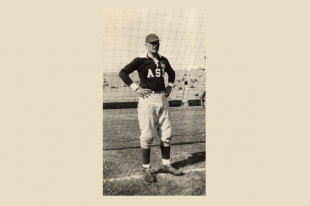 However, he was stationed in Washington that season, attending a school for diving training, and was able to get away on weekends to play for Hispano. He won a second U.S. Open Cup with Hispano the following year. Olaff was born and raised in Bayonne, N.J., across New York Harbor from Manhattan and Brooklyn. His father was a former Swedish seaman who had jumped ship in America and then joined the National Guard to gain American citizenship. As a teenager, Gene began a steady rise through the ranks in New York area semipro soccer. While still in high school, he played for the Bayonne Rangers club and the B team of Brookhattan in the Bronx. After high school, he played two season with the Hatikvoh Football Club of Brooklyn, then two more with Brooklyn Swedish before reaching the American Soccer League level. Hispano, which had been playing in the ASL for a decade, signed him at the start of the 1941-42 season, and he quickly became a fixture there, playing for Hispano until he retired as a player in 1953. 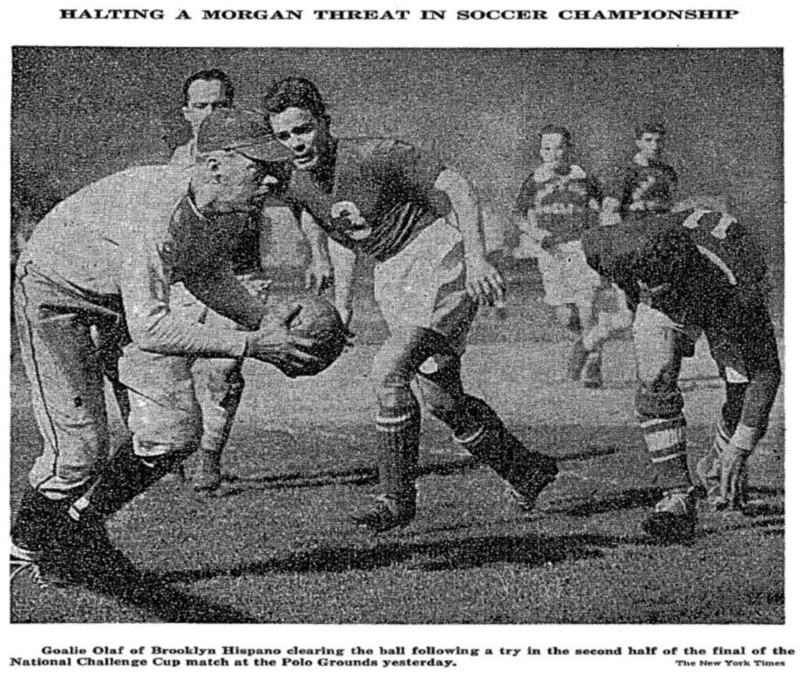 Olaff played twice for the U.S. men’s national team, against Scotland in 1949 and against Israel in 1948 (in a game that is not listed by the USSF as a full international). He could have been a member of the U.S. team at the 1950 World Cup – he was good enough to have been the backup goalkeeper – but by then he was started on a career as a policeman, and was forced to choose. He probably made the right choice, since he was nearing the end of his soccer career and still had in front of him a police career that saw him become, 25 years later, the commander of the New Jersey State Police. Among the highlights of his police career, he lists heading the state police detachment that escorted Soviet premier Alexei Kosygin from his hotel in Manhattan to the summit meeting with President Johnson in Glassboro, N.J., in 1967. The hallmark of his time as superintendent of the state police was his crusade to clean up corruption within the department. Olaff’s two national team appearances were probably fewer than he merited, but his timing was unfortunate on that score. Thanks to World War II, the United States didn’t play a single full international between 1937 and 1947. However, Olaff made up for that in a string of games between all-star teams and visiting foreign clubs. He played for ASL all-star teams against Liverpool in 1946, Djurgardens of Sweden in 1948 and Inter Milan in 1949, and for New York all-star teams against Atlante of Mexico in 1942, Liverpool in 1946 and 1948, Hapoel of Palestine in 1947, Belfast Celtic in 1949 and Manchester United in 1950. Olaff is the dean of the National Soccer Hall of Fame, the man who was elected longest ago among the more than 70 living Hall of Famers. Olaff was elected to the Hall of Fame in 1971, and has been a regular attendee at induction ceremonies in Oneonta, N.Y., and elsewhere in the decades since. One of Olaff’s closest friends over the years has been another Hall of Famer, Jackie Hynes, who died in August. The two were frequent opponents on the soccer field dating back to the 1930s and make an interesting study in contrasts. Hynes, who lived on Staten Island, was from New York, while Olaff is from New Jersey. Hynes was in the Army in World War II, while Olaff was in the Navy. Hynes was a New York City fireman, while Olaff was a policeman. Hynes played mostly for teams from the Bronx, while Olaff played mostly for teams from Brooklyn. And perhaps most important of all, Hynes was a forward, while Olaff was a goalkeeper. Those contrasts didn’t stop them from being fast friends for more than 70 years. He is an elder at his local church and a daily presence at the youth athletic field that rolls for several thick green acres across the street from his home. But few people in Florence know who is really is – the legend, that is, a man of prodigious dimensions in a time long ago. His dog could care less. Olaff eventually excused himself to whip us up some tuna salad sandwiches in his corner galley kitchen. At seventy-seven years old, he is white-haired and slightly stoop-shouldered. The dog is in the prime of his life. His name is Donovan. He’s a ginger-colored, anvil-headed pit bull with darting eyes and a set of gnashing chops that are the hallmark of his breed. Donovan was quick. Donovan was strong. Donovan was looking for an open lane to the countertop. I sat at the kitchen table, biting my lip to keep from laughing. Donovan lunged for the loaf of bread next to the sink, but Olaff had anticipated the move. Never looking up, he sidestepped into Donovan’s path and delivered a crunching hip check that sent the animal sliding across the kitchen. Donovan looped into the far wall, tail over head, no doubt wondering how the old man did it. He was cradling a slice of toasted white bread in a gnarled left hand. His fingers were crooked, bent at odd angles, with knobs of scar tissue that marked the spots where the many bones were broken many years ago. His spine has been surgically fused in a couple of places, so his movements are a little stiff. But the old quickness was still very much in evidence. Such is the life of a dog sharing a house with a Hall of Fame goalkeeper. Gene Olaff never has been one to let very much get past him. Note: You can read more about Olaff at ESPN and ussoccerplayers.com.